1) It’s ok to get sick. 2) It’s ok to get served. Over the last six years I can probably count on one hand how many sick days I’ve used at our church. But this year, I’m blowing the sick days of the water. And it’s only February. I spent most of the last three days piled up in a feverish mess. I started feeling bad during the Super Bowl (I didn’t find it alarming because many people feel this way during the Super Bowl depending on which team you’re cheering for). Regardless, I went to bed aching and shivering–blaming my husband for the leg work out he put me through the Thursday prior. But it wasn’t just my legs that were sore. It was everything. On Monday I asked Coy to take me to the urgent care clinic. I had to be dropped off because our daughter needed picked up from school (this is now Monday afternoon). The doctor who I had seen already in December….and in January… goes through the routine of telling me that there’s nothing he can do. It looks like a virus, but here’s some antibiotic in case your sore throat is more than a sore throat deal. He prescribed the same thing he did last time and I went outside to wait on a bench to be picked up. I feel asleep, for maybe an hour. God sunburned on my face. And hallucinated that I had malaria and was going to die. And I was ready to go back to work the next day. Because being sick rots. And I don’t like missing work. I love my work and it bugs the living daylights out of me to miss days of precious connection time. What a waste! What I wasn’t prepared for was an “intolerance” to the medication that led to gut wrenching stomach pain and unnecessary toilet glorification. I hugged that nasty ceramic throne more this round than I’ve have in my whole life. By Wednesday, I’m feeling like I’m moving in to starvation mode. Nothing is staying down. Time to see a new doctor. She discovers the intolerance. Gives me something for the nauseousness and I’m back on the streets. At the same time–we are having our house re-piped. In fact, we haven’t had hot water for two weeks. This is sort of inconvenient if you need to ummm do anything at all, especially if you’re “ick” sick. So I went to a friends house, to lay on her couch. And she gave me permission to get well there. I slept on new meds for four hours and woke up feeling like I could probably live another day. I grew a huge appreciation for plumbers. Have you ever watched a plumber repipe a home? It’s not easy. They don’t seem to eat or drink or rest. All the while I laid in bed getting sick all over the place. Wow, they took one for the team. Friends show up when you need them. One came by with soup another with her entire medicine cabinet. My sister is rapid fire shooting emails over the miles with her remedies. Only the Lord knows what I said to them or what I looked like while this was going on! 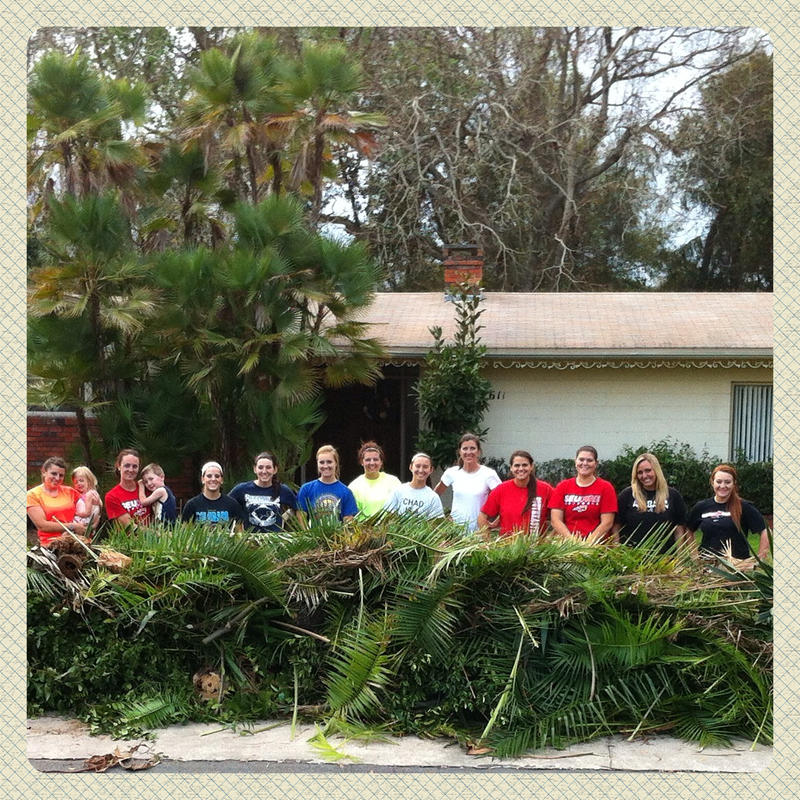 And to top off my humble pie, the entire ladies softball team from Southeastern University stopped by my house on Thursday (my first day back at work since the what I’m calling the Darth Vader flu) and they began to demolish the jungle that came with the purchase of our new house. Axes, shovels, knives…you name it, they went to town on our overgrown yard while I scurried around doing not a whole lot. No need to feel bad. aren’t allowed to be sick. We fight through all sorts of crap that comes our way in the name of ministry and yet our bodies are in desperate need of rest and nourishment. There are some Wednesdays when I can’t remember if I ate or if I sat down. I’m not a plumber and my job may seem like cake. But relational energy can be just as strenuous. It’s easy to forget that ministry does take something out. There have to be moments where replacement occurs. I rarely let myself be sick. Or put myself in positions to be served. This time I didn’t have a choice on either front. There is a time and season for everything under heaven and there will be days when you feel like you’re going to barf your last pizza remmnats from your body, days (or weeks) when you disappear from social media, or times when you need someone to bring you soup and crackers and ginger ale because you can’t move two inches to get it yourself. And it’s ok for friends to take care of you. It’s ok to take a sick day. Being well is worth it. And we be so much better on the comeback. Well, it’s hard for me to accept. It feels foreign because our vision is set outward. But when we accept the service of others. We get to see what it feels like. It strengthens our resolve to serve others because we know what it can do in a persons heart. It enfolds us in life giving strength and care. It causes us to want to give this more others. It’s has a domino effect. Friends brought soup, tea, vitamins, let me crash on their couch, use their showers, took care of our lawn abundance…and ultimately reminded me of why we do what we do. Because we want to be a little more like Jesus than we were yesterday. And sometimes, we need to be on the other side of things to really understand how it all works. So while it’s awesome that you work like a dog and you serve others with an unrelenting passion. It’s equally awesome that you would let yourself rest, get well, receive blessing if it comes to your doorstep, and thank God for the opportunity to know a little bit more about love today than you did yesterday. Have you had a moment like this lately?